A new interactive, online decision-making tool helps providers understand and maximize hepatitis C virus (HCV) treatment coverage options for people living with both HIV and HCV. 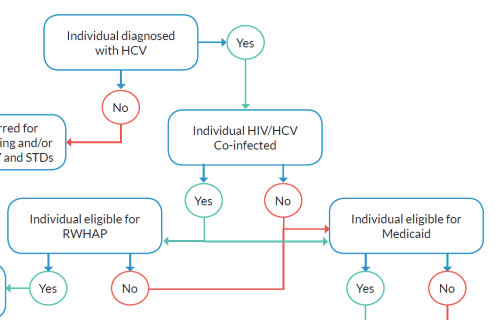 By answering a series of questions about their patients, the decision tree tool illustrates and clarifies the myriad HCV treatment coverage options, including the Ryan White HIV/AIDS Program's AIDS Drug Assistance Program (ADAP). The advent of curative treatments for HCV has been especially important to people coinfected with HIV and HCV since one in four people living with HIV in the United States has HCV. Viral hepatitis progresses faster and causes more liver-related health problems among people with HIV than among those who do not have HIV. Liver disease, much of which is related to HCV, is a major cause of non-AIDS related deaths among people living with HIV. Studies have demonstrated that the new treatments, known as direct-acting antivirals (DAAs), are very effective among people coinfected with HIV, with cure rates of 97%. But access to HCV treatment remains a challenge for both clients and providers. Many health care providers are not aware of all available treatment coverage options and still rely on pharmaceutical companies' patient assistance and cost-sharing assistance programs. But many state ADAPs cover DAAs for HCV treatment in instances in which other payers (e.g., Medicaid, private insurance) deny coverage, and the number of ADAPs that include one or more DAAs on their formulary continues to increase. To help optimize the uptake of curative HCV treatment among people living with HIV, NASTAD launched the new online decision tree to assist health care providers to navigate the options that may be available to pay for HCV treatment for people living with HIV. NASTAD, an association that represents public health officials who administer HIV and hepatitis programs in the United States, developed the tools with support from the Health Resources and Services Administration, which administers the Ryan White HIV/AIDS Program. View the tool: "Strategies to Increase Access to Hepatitis C (HCV) Treatment within ADAPs: Provider Decision Tree ." A printable PDF of the decision tree is also available. Please share this new resource with HIV and/or HCV service providers, including those who work both within and outside of the Ryan White HIV/AIDS Program.